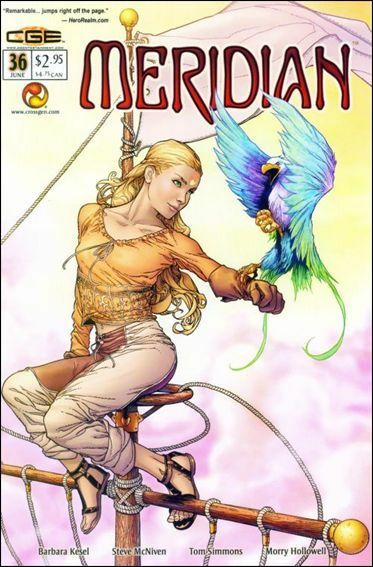 Meridian is a comic by CrossGen. It's set in a universe of flying ships and floating islands. The comic follows a noble girl named Sephie and her uncle Ilahn, both of whom receive mysterious Sigils at a reception on Meridian, the island that Sephie's father rules. Each Sigil seems to grant a different set of powers; Sephie focuses on healing and gentle pressure, while Ilahn uses his abilities for destruction and intimidation. Colour-Coded for Your Convenience: The dark, brooding uncle's powers of destruction are red. The cheery and friendly girl's powers are yellow/gold. Cool Airship: The flying airships that travel between islands count as this. Fertile Feet: Sephie falls from a flying ship at high altitude and lands in a toxic wasteland, making a human-shaped crater around which plants start to grow. Floating Continent: The wealthy in the world of Meridian live on floating continents to stay away from the polluted (Blighted) ground. Good Colors, Evil Colors: See color coded above. Grey Goo: The ground pollution that causes ground structures to erode and fall apart quite quickly. All surface cities are continually being rebuilt. A Million Is a Statistic: Sephie's uncle sends an entire floating island to the ground, killing nearly everyone on board. Somehow it has less emotional impact then the death of the girl's parents. Missed the Call: Sephie wasn't intended to be one of The Chosen Many. It was her father... but the power killed him, and it jumped to the next successor: His daughter. Sky Pirates: Where there's flying airships, there's sky pirates. Steampunk: But only if you're wealthy enough to live on a floating island. Also some coalpunk for the super industrial island.